Quenching for some fun, after all the churches, and other sightseeing, Casino Peace in Sheraton will bequeath you with a fun night of lots of games, leisure, drinks and scrumptious food. Hosting a total of 90 slot machines, this casino has a plethora of games including Progressive King Kong, Extra Cash, Progressive Star Gate, ElectronikRulet, Novamatic Admiral Gaminator, Diamond and even Atronics Oxygen Diversity Blue! Among a ton others. A fun night, guaranteed, none the less! Carry some USD too with you. On foot, by bicycle or bus. How popular is Casino Peace? 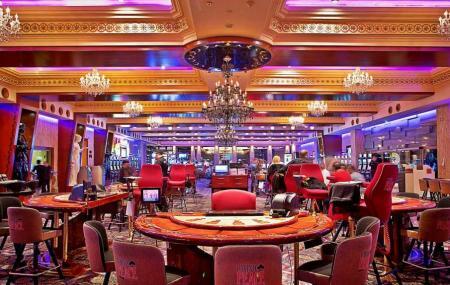 People normally club together Batumi Mall and Batumi Aquarium while planning their visit to Casino Peace. Nice place. Pleasant staff and great service. Regularly adding new slot machines. Tasty food. Playing electronic roulette is highly recommended. For non-smokers: keep in mind that smoking is allowed here. Good casino, lots of black jack tables, roulettes, and machines. Good service as well. Has semi private and private rooms for special guests. The best casino in Batumi since opened.